UPDATE: It’s sold out at $70, but you can still get this awesome sous vide cooker at a $90 discount, or you can get the Anova 800W Bluetooth model for just $75. For the latest sales, be sure to check out our Prime Day deals master list! EARLIER: We obviously know it’s Prime Day right now, but this is one of those sales that’s so crazy it seems like it must be a mistake. And just in case it is a mistake, you should definitely jump on it right now. 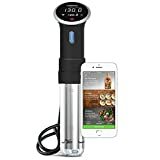 The Anova 900W Culinary Sous Vide Precision Cooker has a full retail price of $200 and it’s worth every penny. It cooks perfect sous vide dishes each and every time, and you can even control it with your iPhone or Android device. Right now for Prime Day, it’s somehow on sale for $69.99. No, really… $69.99! Well what are you waiting for!? EASY TO USE- simply attach the precision cooker to any pot, add water, drop in desired food in a sealed bag or glass jar. Start cooking with the touch of a button on the device. The sous vide cooker’s timer and precise temperature control allow you to step away and relax while your food cooks perfectly. No additional equipment needed.